Starting today, popular taqueria Dos Toros is offering free burritos in way of its new app Burrito Time. In case you’re thinking that this is too good to be true, trust us, it’s not. 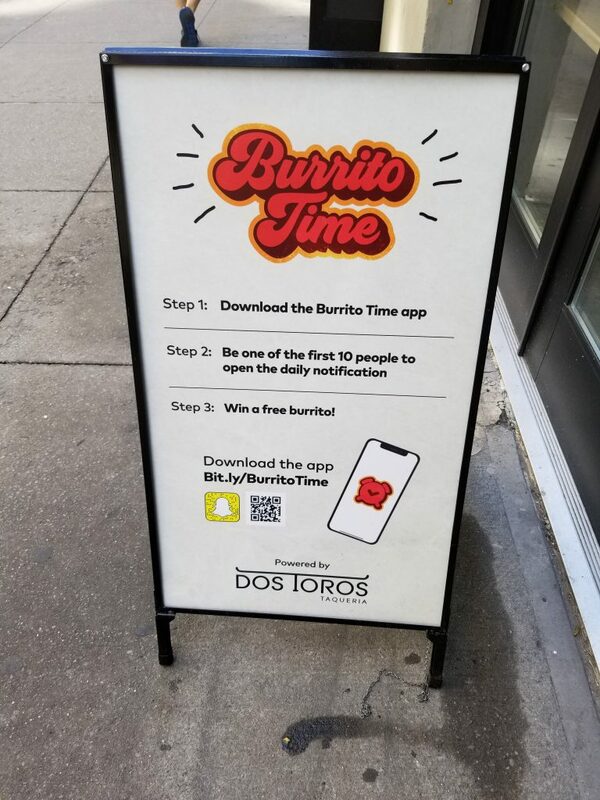 Every day Dos Toros will be “dropping” free burritos at a random time and those who use the Burrito Time app will receive a push notification on their phone as soon as the drop happens. The first 10 people to open the app will receive a virtual burrito card that they’ll be able to use at any Dos Toros location. Leo Kremer, co-CEO of Dos Toros, said that that the “Burrito Time” app came to fruition due to the executive team’s desire to create an app that stood out from their competitors. They are looking for a way to capture the attention of their customers once a day, similar to how people will stop everything they’re doing in order to play popular mobile games like HQ. The agency behind the app is Brooklyn-based MSCHF, which has worked with other companies to develop quirky activations like Instacart’s Instacat Chrome extension. The Burrito Time app won’t let you order any food or showcase the chain’s delicious menu but instead directs users to the Dos Toros website for locations and links to the official Instagram. However, the app does include a virtual wallet, a list of locations and an FAQ. While Dos Toros doesn’t have a formal rewards program, the burrito shop has done special events in the past, ranging from free guac on 4/20 to $1 burrito specials every time a new location opens. Let us know if you plan to use Dos Toros’ new Burrito Time app in the comments section below and be sure to subscribe to The Sitch for more foodie news and other entertaining reads.